2015 Americana #44 Chris Jericho BLUE in mint condition. 2006 Topps Heritage Chrome #12 Hulk Hogan in mint condition. 2013 Upperdeck Goodwin Champions #93 Hulk Hogan in mint condition. 2008 Topps Heritage III Chrome WWE Allen & Ginter Superstars #7 'Rowdy' Roddy Piper XFRACTOR in nmt condition. 2008 Topps Heritage III Chrome WWE Allen & Ginter Superstars #9 Sgt. Slaughter in nmt condition. 1987 Topps WWF Stickers #17 Andre The Giant in mint condition. 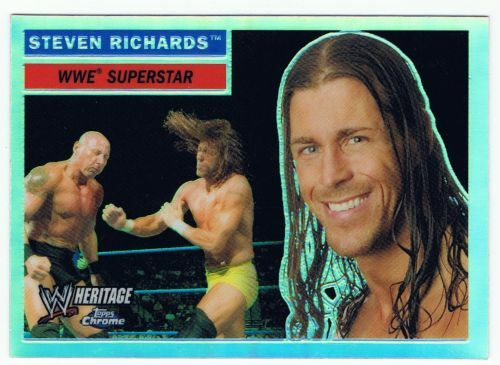 2006 Topps Heritage Chrome WWE #32 Steven Richards Refractor in mint condition.